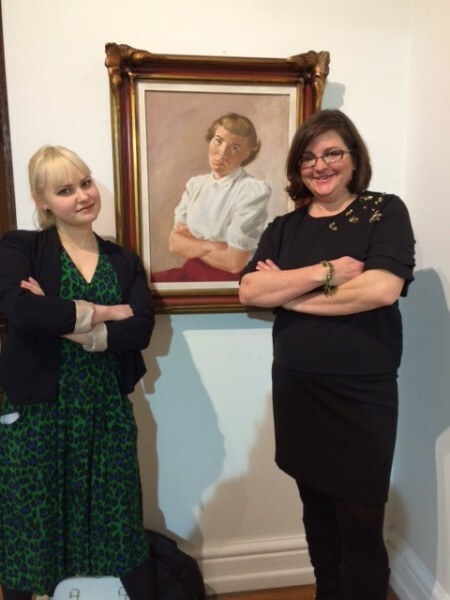 Amanda Ackerman and Emily Frey are the curators for the brilliant retrospective of about three hundred works by Edith Harper, collaborator and wife to Cincinnati’s well-known and beloved artist/illustrator Charley Harper. Their lives, work and art bear a similar pattern to the well-known West Coast couple, Charles and Rae Eames, of the Eames chair fame. While there are other couple-collaborators, such as Claes Oldenberg and Coosje van Bruggen and Christo and Jeanne-Claude, both the Eamses and the Harpers began working together from the onset of their respective relationships, in long, collaborative and happy marriages of life and art. We should all be so fortunate! I was immediately struck by the lush, Bauhaus sensibility that infused Edie’s oeuvre. The philosophy of the Bauhaus is that all arts matter, high art and low art, meaning painting and sculpture standing parallel to the crafts (ceramics, weaving, woodworking, etc.). Thus, Edie experimented with weaving and Bauhaus-era Annie Albers, wife to acclaimed painter/colorist Josef Albers comes to mind as a guiding light to Edie. Annie Albers used weaving to showcase her contemporary vision of color and her embrace of the aesthetic validity of weaving, an historic art form, a woman’s art form, and a longstanding craft form. Edie’s weavings are a delight to see, beautifully paired in one of the gallery rooms along with highly textured drawings and trace monotypes. Edie’s vision, across media, is rock solid. 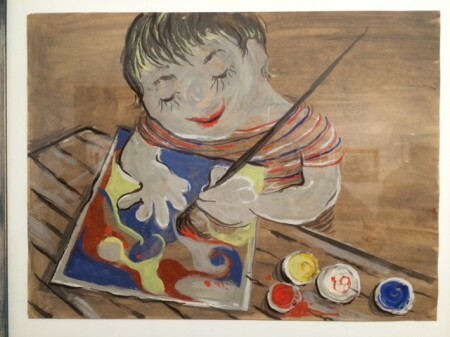 Because the curators waded through thousands of works of art, and Edie’s journals to have guidance in their choices, they chose to focus on several large themes. I think any audience will respond warmly to any or all of the themes. The retrospective, which takes up the entire second floor of The Carnegie, starts with the Art Academy Years revealing Harper’s formidable vision and skills. Her artwork evolved with a light touch, a unique vision, humor, a willingness to try many different mediums, and a strong graphic sensibility. She was of her time, neither dated nor revolutionary. Photography 1943-1947 showcases Edie’s command of photography and the vigor with which she explored abstraction. The Army Corp of Engineers employed Edie in Cincinnati during World War II. These photographs hold their own and Harper had a solo exhibition of her photographs in 1961 at the Contemporary Arts Center, Cincinnati. She could have had a career with such accomplished photographs but other media spoke to her more strongly. 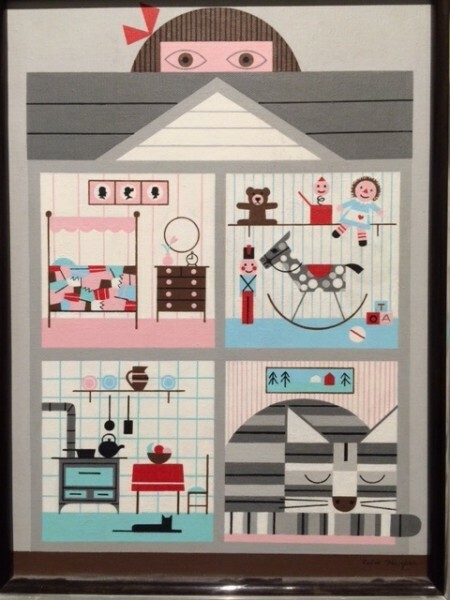 Feline Friends is a delightful grouping of art works showcasing Edie’s love of cats. It was hard to find a few of the cats. 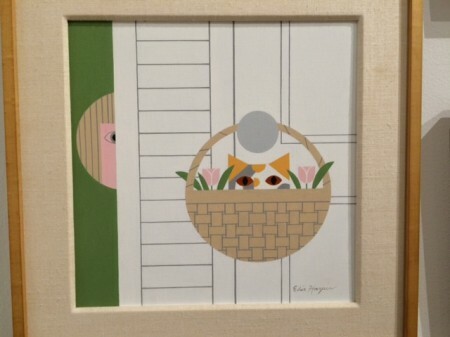 With Edie’s sense of design and humor, you look hard to find a stylized cat hiding in plain view. An entire industry could be built on these designs, using them as a basis for fabrics – like Vera did – and dishware, wall coverings and fashion items. A sense of great design is at the core of Edith Harper’s artwork. Childhood Memories is a very tender section of the exhibition. Edith grew up in Kansas and she exploded as an artist once she was accepted to the Art Academy and came to Cincinnati. 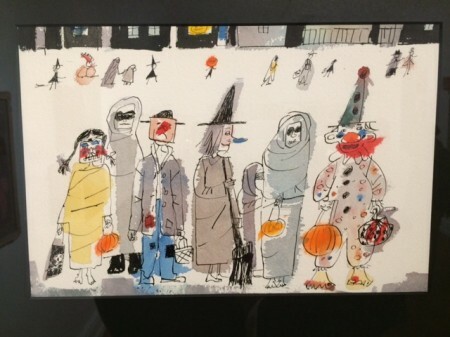 Her watercolor, Halloween, is a really fresh composition of trick-or-treaters walking to the next house. The children in the foreground are delightfully observed, of different ages, sizes and costumes. The background/top of the watercolor is dark because it is the bottom halves of houses on the other side of the street, rendered small. This gives us a sense of child scale, that the children in the foreground are small and that their task of walking through the neighborhood is large. New Look at the Old Book features Biblical themes Edie tackled with an aim to give these traditional narratives a Modernist feel. These artworks are very cohesive; some works are acrylic on canvas and others are serigraphs, a perfect medium for Edie’s stylized and smoothly painted art works. In the panel discussion, Tony Dotson, the other artist featured at The Carnegie, said that Edith Harper’s spare depiction of the Last Supper “blew him away.” This suite of works would make a handsome book since the works are so cohesive and employ simple circles for many of the Biblical personae. The art works lacked emotional intensity because design and compatible color palettes were dominant elements. Speaking of color palettes, Edie Harper made the most imaginative Color Wheel I have ever seen, hanging in the Rotunda section of the second floor. Geo-Graphics is a small but interesting section of Edie’s artwork, mostly oils and watercolors that show her virtuosity with paint. They appear to have been done on location during travels to various parts of the USA. In the Van Gogh exhibition at the Cincinnati Art Museum, Van Gogh wrote to his brother Theo, “The greatest, most powerful imaginations have also made things directly from reality that leave one dumbfounded.” Edie Harper was a very keen observer, from making a painting looking directly down into the compartments of a Christmas ornament box, to painting a fresh watercolor of mountains in a National Park. 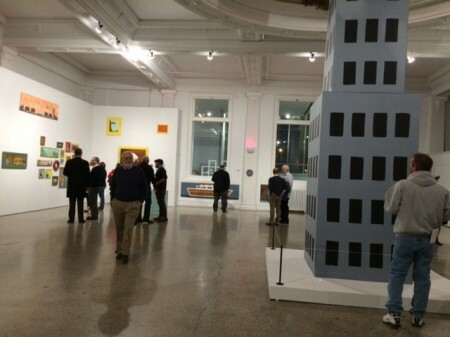 This exhibition was long in planning by the Charlie Harper Estate that everyone in the Tri-State should see. It is commendable that The Carnegie selected Edie Harper to show in its marvelous gallery spaces. The other artist featured, Tony Dotson, shares with Edith Harper a preference for stripped down forms and for painting in a smooth, non-expressionistic manner. His scale is generally also modest, as is Edith’s, though there are a few larger paintings and an enormous King Kong sculpture that shoots up into the rotunda from the main floor gallery. These points make for a really fine pairing of exhibitions by Carnegie’s Matt Distel. There are two main problems with the exhibition here. First, Dotson calls himself an American Outsider, part of the title of his solo endeavor. The term “outsider artist” was coined by Carl Jung whose groundbreaking use of art for therapeutic uses is widely known. British art historian Roger Cardinal is credited for bringing the term “outsider artist” to describe a designation for true autodidacts he viewed in Europe in the early and mid-twentieth century. The most significant and earliest of these was Adolph Wolflie of Bern, Switzerland. Wolflie was in a mental institution and his empathetic psychiatrist saw Wolflie’s incessant impulse and passion for drawing and gave Wolflie drawing paper. These are now highly prized. Not all outsider artists were mentally ill, but many were and are. Others, like Wisconsinite Fred Smith, took up art after a long work life in hard labor. Smith’s Wisconsin Concrete Park, located on Hwy 13 near Phillips Wisconsin, is a must-see for any outsider art aficionados. Though it was damaged in two devastating storms, it has been adequately restored. Smith is also a true autodidact. I suggest Tony Dotson drop his moniker of outsider artist and just say as he told me, “Hey, I took up painting as a stress reliever from my job in the music and sound production industry in Cincinnati and fell in love with outsider art.” Tony bought an outsider artist Mose Toliver painting for $300 and said, “It changed my life.” Dotson uses only cheap house paint he finds at Restore, or the reject bin at local paint stores in emulation of outsider procedures. Howard Finster, one of the big names in outsider art, claimed he dipped his finger in a can of house paint and saw a portrait of Jesus in the paint daub, launching his long career as an outsider artist. So Tony is following in a solid path; it’s just that his artwork is not very interesting. He doesn’t have the vision of Grandma Moses – we all know about her – nor the obsessiveness (a real hallmark of outsider art) of such giants as Wolflie, Smith, Finster, Henry Darger, James Castle and others. That said, he sold his banal King Kong sculpture on opening night. The buyer’s company uses the name King Kong in its title and this sculpture will grace (collect dust?) in the headquarters. Beauty is in the eye of the beholder. I encourage Dotson to keep working and to cull only his best artworks for future shows. 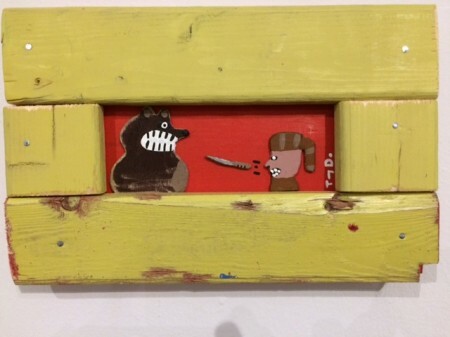 One such piece is Grizzly vs Daniel Boone, a small painting with a rough hand-painted frame. The subject fits the picture space well and the humor is palpable. Enjoyed your article on the Charley and Edith Harper, and Tony Dotson show at The Carnegie gallery in Covington, KY. The pictures you feature in your article go well with what you have observed and written about the work of the two sets of artists. Your explanation for what is “outsider art” was straight forward and clear. Such artists rarely, if ever, have academic training in the field of art. What’s going on in the last 3 paragraphs of this review? The author is irritated that Dotson calls himself an Outsider Artist, and the tone of the review devolves to pettiness. Dotson has every right to call himself an Outsider Artist. Most Outsider, Visionary, Primitive, Intuitive, Naive, Artists are tagged as such by other people. Dotson has voluntarily claimed his movement just as Dubuffet did way back when, just as many Raw Vision artists do now. To question whether Dotson is a true autodidact (whatever that is) is a baffling indulgence by the author. I attended 6 years of art school–I have no idea what I was taught and what I learned on my own. By questioning Dotson’s use of the moniker, the author is only adding more musculature to terms that get in the way of asking and answering the important questions: does the art “work?” and “what does the art do?” The art isn’t interesting? Fine. Why? Because the artist is working under “false pretenses” isn’t good enough. Also, it’s 2016. There are thousands of Outsider Artists who work within aesthetic traditions, beyond the dusty criteria of what an Outsider Artist has to be. My advice to the author: stop worrying about monikers, review critically and intelligently the show you were hired to review. And don’t reduce yourself to catty remarks. We have Facebook for that. I am always happy to have dialog with readers. I disagree with the reader who thinks my review devolves into pettiness as I was quite careful to write in a measured way without using harsh language. I have a long history with outsider art where my mentors supported outsider artists in Chicago, mostly Henry Darger, but also others. These mentors pointed me to Fred Smith, a Wisconsin-based outsider artist whose Wisconsin Concrete Park is on the Outsider Art National Register. Now, some folks make the definition of outsider much more broad and it seems Schmit and those who support Dotson are in this group. Some people say, “I didn’t go to art school I learned on my own.” You are in company with Tony Bennett, another outsider artist and really famous singer. 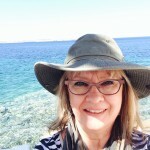 Elke Summers is another. There are a lot of talented and accomplished individuals who take up visual art at some point. This broader definition is not for me. If you are schooled and part of the mainstream culture, you are not an outsider artist. You didn’t imagine and build Watts Tower. This is where I draw a line, and its not a fine line. Thanks for your input though! I am grateful for your dialog.